Before using a hazardous substance read the label. It will include useful information about the harms the product can cause and how to protect yourself. You may see signal words like WARNING or DANGER on the label of the hazardous products you use. WARNING is used for less dangerous substances while DANGER is used for the most dangerous ones. Products imported from Australia may use the signal words CAUTION, POISON or DANGEROUS POISON. CAUTION is used for the least dangerous while DANGEROUS POISON is used for the most dangerous substances. Hazard statements may also be on the label. These statements alert you to the harm that the product can cause for example, MAY CAUSE MILD SKIN IRRITATION. Precautionary statements are phrases on the label that describe what you should do to reduce or prevent harm from hazardous substances, for example, KEEP OUT OF REACH OF CHILDREN, or, USE ONLY OUTDOORS OR IN A WELL-VENTILATED AREA. 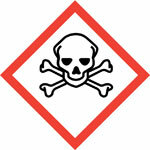 Product labels sometimes have symbols (pictograms) on them to warn you about the harmful properties of the product. Use the information below to find out what these symbols mean so that you know the harms of the product before using it. These symbols are for products with oxidising properties. The products could be gas, solid or liquid and can cause or intensify fire and explosion. 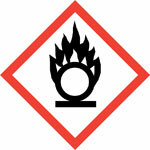 Keep products with these symbols well away from flammable products. Organic peroxides may contribute to fire, explosion or chemical decomposition. Products with these symbols on the label are corrosive and can cause severe skin burns and eye damage. They may also be corrosive to metals. 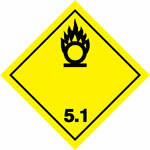 Products with this symbol on the label are products where gas is kept under pressure. These products may explode when heated. If they are refrigerated gases they may cause cryogenic burns or injuries. Even normally safe gases can be dangerous when pressurised. Products with this symbol on the label are acutely toxic. 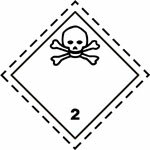 If you see this symbol on the label you need to be aware that you are handling a very dangerous product that could even cause death if it comes into contact with skin or you inhale or ingest it. cause allergies, asthma or breathing difficulties when inhaled. They can also be respiratory sensitisers.